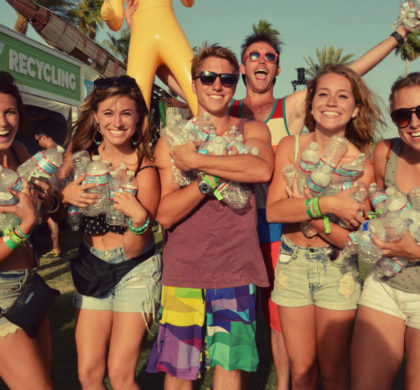 Recycling is one of the most important actions you can take to preserve our environment and not to pollute it further, however sometimes recycling objects like aluminum cans are hard, because they take up a lot of space when they are in their full form and often they need to be taken to a specific location to recycle them properly. 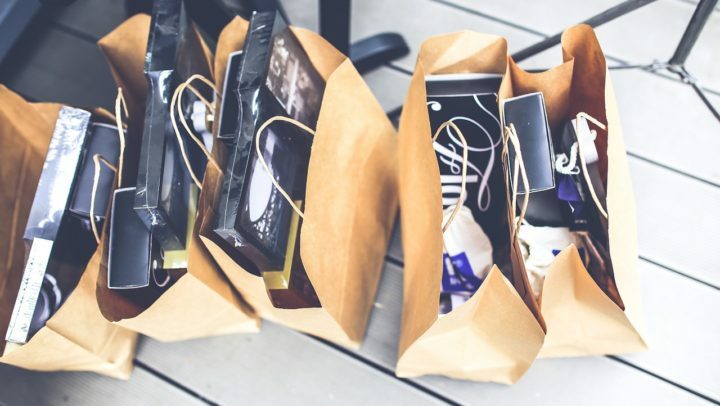 That is why it is a good idea to use a can crusher to help you recycle these cans, because can crusher will compress the cans into very small size and will make it easy for you to store them until you get the chance to take them to a recycling plant, because they will take up much less space. 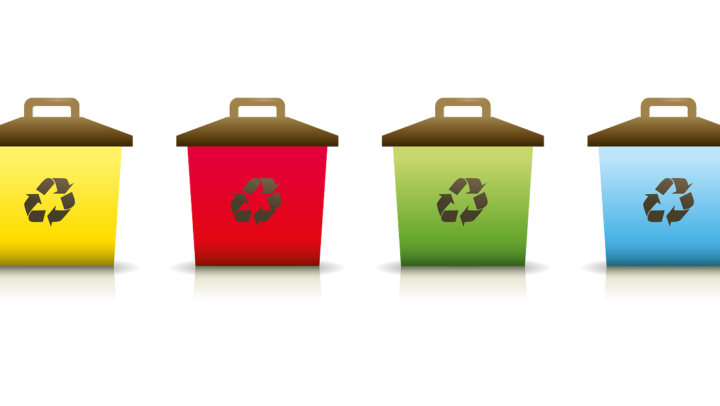 Moreover, the recycling process is easy and even fun, especially if you use a semi-automatic can crusher that will dispense the cans itself and all you need to do is place a bin under the crusher, place a can into it and pull on the handle. 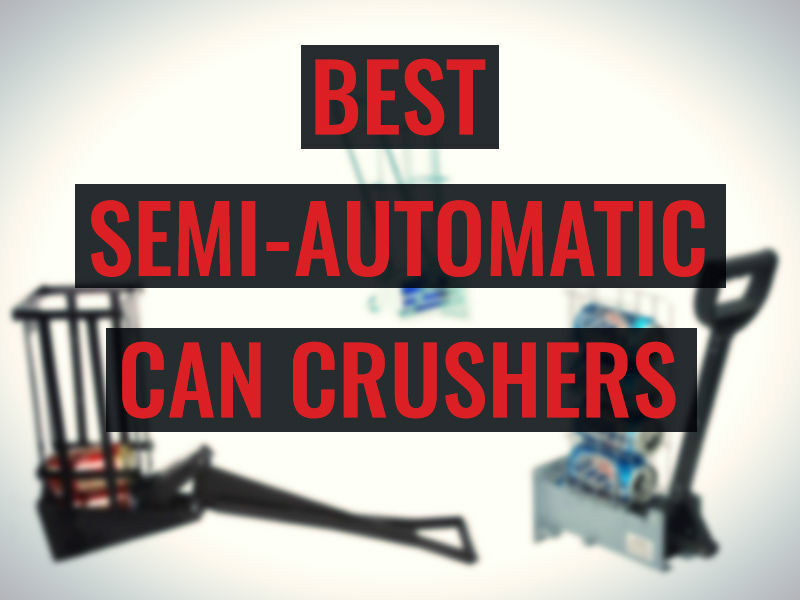 But because there are many different semi-automatic crushers out there that all are of different price range and with different features, here I compiled a list of the best semi-automatic can crushers. If you want a semi-automatic crusher that can hold multiple cans and that is durable to indoors and outdoors conditions, you might want to look into this can crusher that is produced by a company called Northern Tool & Equipment which is a family owned tool manufacturing company based in Minnesota. 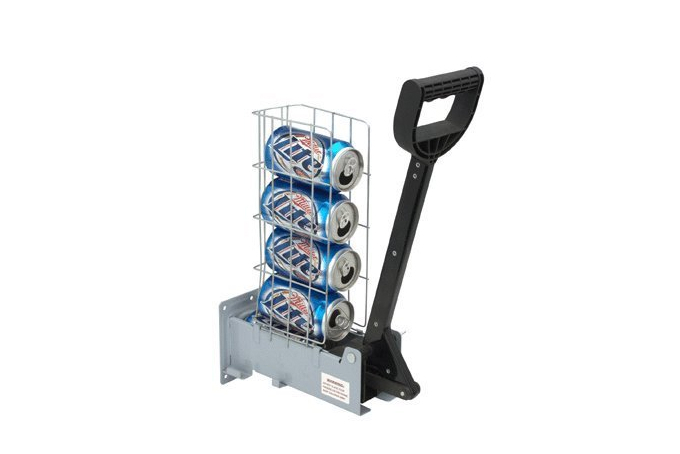 The great thing about this vertical can crusher is that it crushes cans that are up to 16 ounces in their size into small aluminum circles. On top of that this can crusher has a can storage basket where you can collect up to 10 cans and then quickly crush them, so you don’t have to crush each can separately, but you can just use the crusher once the collection basket is full. Although this crusher doesn’t have a collection bin for crushed cans, you can just place a trashcan or any other bin under the crusher and the automatic system will make sure that your compressed cans go right into this bin. 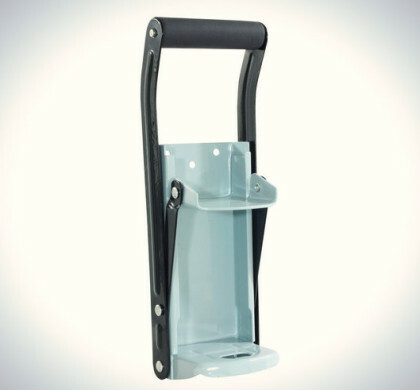 Because this can crusher whose dimensions are 23.3 by 16 by 18.9 inches is made out of black nylon plastic, it is durable and rustproof, meaning that it can withstand many different conditions including outdoors use, so you can use it for outdoors parties or simply mount it to a wall outside and it will blend in in any interior. You crush cans by pulling the leaver upwards, which although is unusual, is still pretty comfortable, especially thanks to the size of the lever. Cans will automatically come out of the crusher, so you can repeat the process literally seconds after the previous can is crushed. The nylon plastic material is durable and rustproof, so you can place the crusher wherever you want. 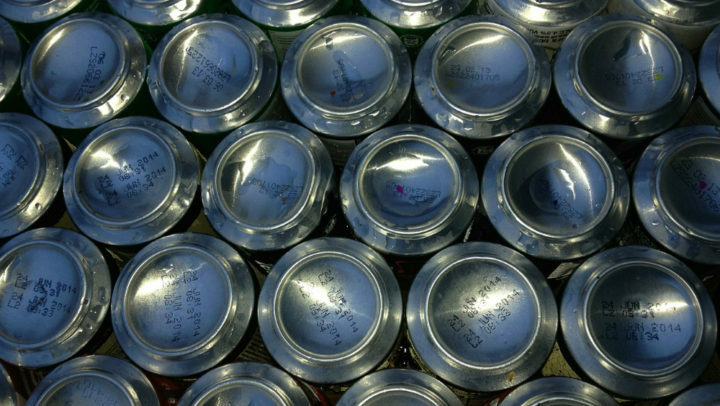 From time to time cans stuck into the crusher, so they need to be removed manually. 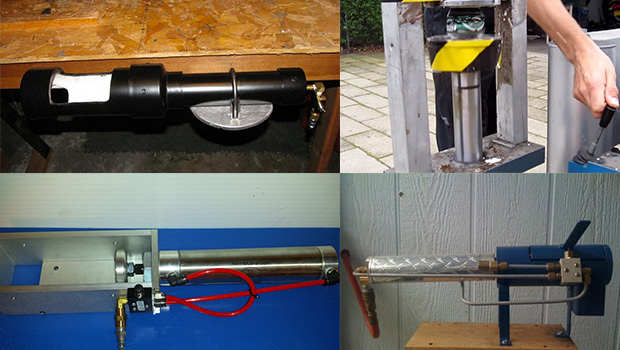 If you want a durable crusher that holds more than one can, but still has a minimalistic look to it, then this vertical multi-load can crusher by XtremepowerUS, which is a home and industrial tool manufacturer based in the US, might be meant just for you, because in addition to the fact that it can hold multiple cans, it has some other great extras. 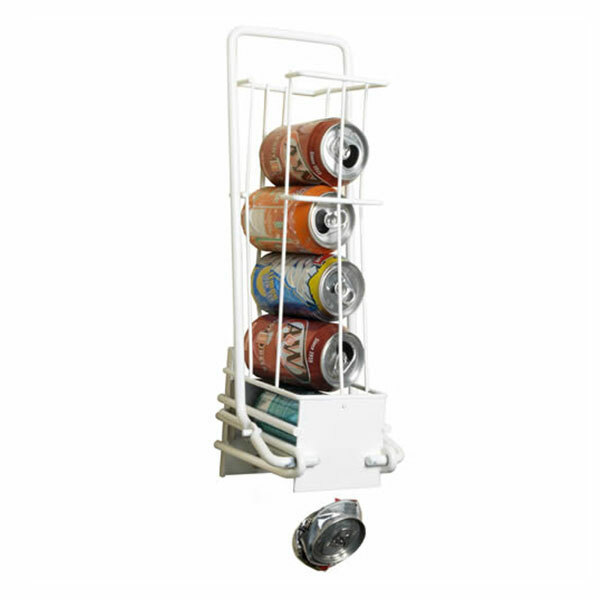 This can crusher like I mentioned before will hold up to 6 cans at one time and therefore makes it easier to store and also to crush cans more quickly, because you don’t have to place each of 6 cans manually inside the crusher before you pull down the leaver. And because it is a semi-automatic crusher, it also has an automatic dispensing system that will automatically remove can from the crusher once it is compressed, so you can crush the next can. Although this crusher compresses cans that are only up to 12 ounces in size and therefore it is quite small – only 12 by 5 by 18 inches in dimensions, it is made out of mixture of steel and plastic that gives the crusher durability to use in different environments and style – the grey and black coloring makes and the simple design lets the crusher be used in many locations from your kitchen to a party space. And thanks to the vertical placement you can mount it to a wall or other similar surface and it will be a great addition to any room. Neutral and simple design, will blend into any room. Cans need to be precisely arranged in the storage basket for the crusher to work properly. For those who want a crusher that already has a collection bin where to store the crushed cans, so that they don’t take up additional space in home, this crusher might be the perfect choice, because this aluminum can crusher by Easy Pull that is a US based company, will let you store compressed cans in a sophisticated bin that will hide them out of sight until you can get them to a recycling facility. 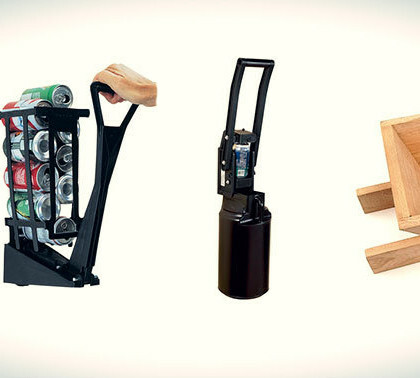 This can crusher is able to crush cans that aren’t over 12 ounces in size, meaning that even though this isn’t the biggest can crusher, it still will do a great job to compress the smaller soda or beer cans. The crusher itself is made out of multiple materials, meaning that every part of the crusher is well thought of and considered. The body of the crusher is made from glass filled nylon that adds extra toughness and durability to the device and moving parts of the crusher are from stainless steel and aluminum that makes the crusher efficient yet durable to withstand the crushing process of aluminum cans. But the 16 inch collection bin that is attached on the bottom of the crusher, where the compressed cans are stored, is made out of plastic, so it will be able to hold a lot of cans while still be light when empty. Because of the design of the crusher, it not only will look good in any place you put it, because the black color and medium size of it (19.8 by 16.51 by 10.16 inches) makes for design that fits into anywhere, but the crusher is also very easy and safe to use by anyone from small children to adults to seniors. Comfortable leaver and great crushing mechanism lets you compress cans without any effort. Doesn’t have multiple empty can storage. If you are looking for something more classical that at first sight doesn’t resemble a can crusher, then this can crusher might be right up your alley, because this crusher which is made by a company called Commercial Zone that more than 50 years now have been producing different furnishing solutions from trashcans to waste containers to can crushers, is a simple yet completely different style of can crusher. What’s so different about this particular crusher is that it is a combination of a can crusher and a recycling bin, meaning that this crusher isn’t meant for mounting on a wall like most other can crushers are. 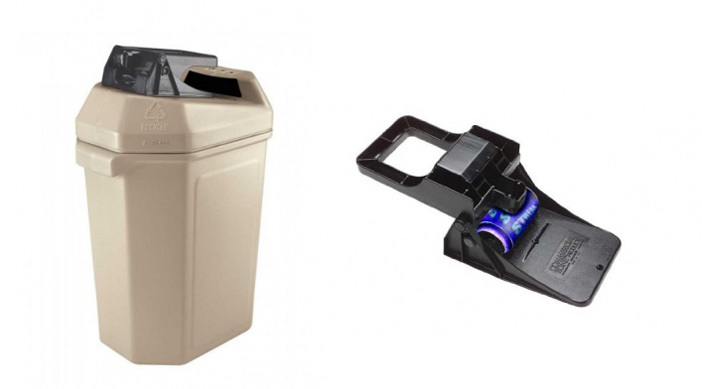 Instead it rests on top of a beige colored trash, meaning that you get two in one – a trashcan and an aluminum can crusher that will help you throw out your beer and soda cans easier. The whole unit is made out of plastic polyethylene, which although isn’t steel, will still withstand the crushing of any aluminum can and will be long-lasting. This can crusher that is 22 by 16 by 33 inches in size crushes cans that are 12 ounces and below, but the collection bin that doubles as a trash can is a 30 gallon bin that can hold up to even 400 compressed cans. 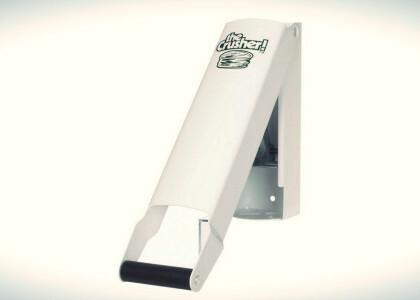 The way you operate this can crusher is – you place a can inside it and pull the plastic handle towards you. Once you put it back in its original position it will release the can into the trash can and you won’t even have to touch the compressed can. Classic design and color makes sure the crusher will look good in any environment. Crushing might take a bit more effort than with wall mounted crushers. And lastly, another option in the best semi-automatic can crusher market is this can crusher from Basic Industries International that is a metal product manufacturer who produces all kind of products from high grade metal, including aluminum can crushers. And because this can crusher is one of their products, you can be sure that this crusher too is made only form the best steel parts. 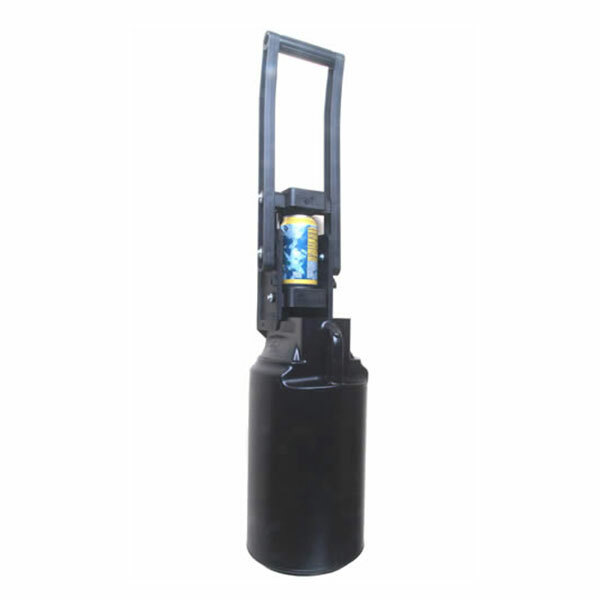 In addition to qualitative steel material that is used to produce this vertical can crusher and that is sure to add durability and strength to the crusher, this product also has other good features. For example, the crusher has a multiple can storage cage, where you can store up to 6 empty cans to crush them later, the automatic dispensing system will let you not only speed up the crushing process, but will also prevent any injuries that can happen when handling crushed aluminum cans, and metallic grey color along with the crushers design makes it simple and suitable for any environment including your kitchen. 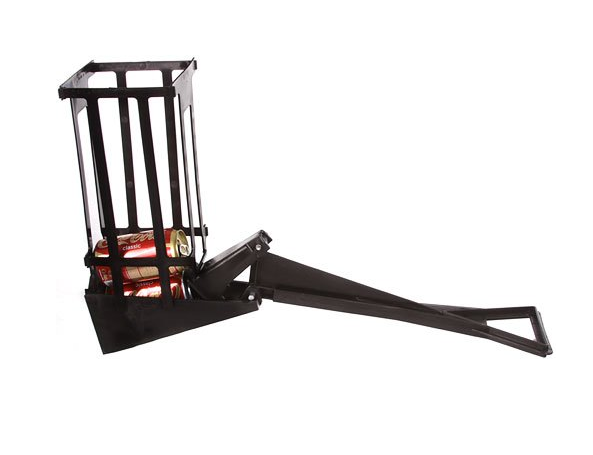 The crusher is 5.7 by 8 by 18.2 inches in size and after it has been mounted vertically to a wall or other similar surface, you can crush cans by pulling down the steel handle and the crusher will compress any can that is 12 ounces or below that size into small one inch thick round. The automatic dispensing system along with can storage lets you crush cans very quickly. Isn’t suitable for extensive usage.